Do you negotiate about responsibilities, strategic decisions, mergers and takeovers or your salary? Or do you negotiate with children and adolescents? Or are you involved in government negotiations? We all negotiate. Every single day. Often without even realising it. Surprisingly our negotiations continuously succeed or fail for the same reasons. How well do you negotiate? 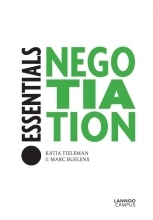 This book gives you four Keys to make your negotiations more intelligent and increase your nq®. It teaches you to bend every negotiation from a stressful tug-of-war into an interaction that creates compelling opportunities. It helps you to explore the negotiating culture of the future and offers you the tools for making your organisation negotiation smart. Essentials - Negotiation offers you the tools to negotiate differently, raise the stakes and define the rules of the game. It guides you towards better results for all negotiating partners while maintaining open and trusting relations. In short, it makes you a driven and skilful negotiator who can look back at the achieved results with great satisfaction. With Essentials, authorative experts of Vlerick Business School help you to become an even more successful manager. Seven volumes cover all critical aspects of modern management. They not only cover the latest research but also offer a wealth of practical hints and advice.